Celebrate the sun, the life giving force that shines bright in all our lives, bringing light and warmth to us all. 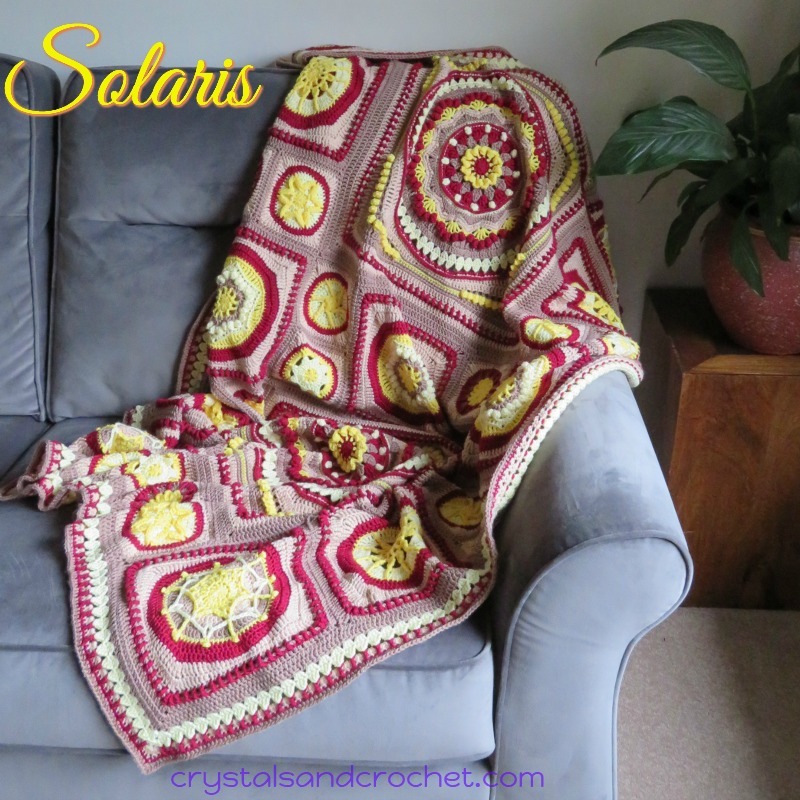 Solaris is a collection of squares and a border for you to create your own perfect sized blanket. Featuring designs of stars, beams and rays. Use your own creativity with colours and combinations of the different size squares to create your own tribute to the sun. There is no limit to the number or combination of colours you can use. Each of the squares are shown below, with the finished size of the square for Double knit yarn with a 4mm hook, and Aran/Worsted yarn with a 5.5mm hook. I used Stylecraft Special Dk in Mocha, Stone, Lemon, Citron, and Claret. I have included some sample layouts in the pattern to help you. The pattern also includes the average amount of yarn used for each square, so you will need to do a little maths to work out how much yarn you will need in total, depending on how many of each square you use, and also how many colours you use. A large blanket made with Stylecraft Special Dk will take between 18 and 22 100g balls. We start with Sunrise, a 20/24inch square. ♥ As we greet a new day, anything is possible, as we draw positive energy from the sun. There are three 10/12 inch squares, Flare, Blaze, and Shine. ♥ Solar flares burst out from the surface of the sun moving energy through the Universe. ♥ A stylised sun, inspired by the ancient Aztec peoples. ♥ The sun shines on us all everyday with it’s life giving warmth. There are four 5/6 inch squares, Sparkle, Glimmer, Ray, and Beam. ♥ When we are positive, and we sparkle like the sun we bring joy to all around us. ♥ There is always light, even in the darkest of times, the star that you are glimmers for all to see. ♥ Rays of light twist and bend to show us there is always another way. ♥ Your light always beams out to touch others. Here are some gorgeous examples of how you can use the squares to make you own blanket, made by my awesome testers. Ineke made a Baby/Snuggle blanket. Using her famous Happy Colours, in Stylecraft Special DK with a 4mm hook. Finished size approx: 115cm/90cm – 45/35 inches.Full details on Ineke’s Ravelry Test page. Lesley made this gorgeous blanket is for her beautiful grandaughter. It sits perfectly on a single bed. She used Stylecraft Baby Aran, in Pink, Lemon, Mint, and Blue, with a 5mm hook. Finished size: 165x104cm / 65×41 inches. Sherrie went large, very large! This gorgeous tribute to the moon is big enough to cover a queen size bed, with drape over the sides. Sherrie used Hobby Lobby I Love This Yarn and a 5.5mm hook. Finished size: 228.6 x 185.4cm / 90 x 73 inches. You will also see that Sherrie opted to personalise her border and keep it very simple to match the edging of the larger squares. Full details can be found on Sherries Ravelry test page. Using a glorious combination of colours from the Stylecraft Special DK range. Green, Emperor, Cypress, Buttermilk, Violet, Royal and Aster. Becky used a total of 5387m/5880yds, and a 4mm hook. You find all the details on Becky’s Ravelry test page. there is no guide, but you will need more of the main colours, the colour I used less of was the lemon. So many wonderful new designs, Helen. I’m really looking forward to getting started on another of your designs, once I get through my WIPs. It’s going to be a teaser deciding where to start… your designs are all so compelling. I like the infinite combinations which are possible with this pattern. It is the ideal take-along project with the squares not pooling on my lap during the liquid-heat Summer in the S.E. USA. I will be able to dug thru my yarn stash. Yeah! Thank you to Helen and the testers. What is the size of Beckie’s using Stylecraft dk?